Models proposed but not made - until now. Model railway manufacturers proposed many interesting new models and livery variation on production models over the years but for reasons not explained, some were not proceeded with to general mass production. In many cases in the past only two passenger vehicle variations of each type would reach production. This was generally a brake second corridor and a composite corridor car. Reproducing some of these extra models would require specialist equipment and skills but others are reasonably straightforward to make by modifying regular production models and components contemporary with the period in time when they were proposed. 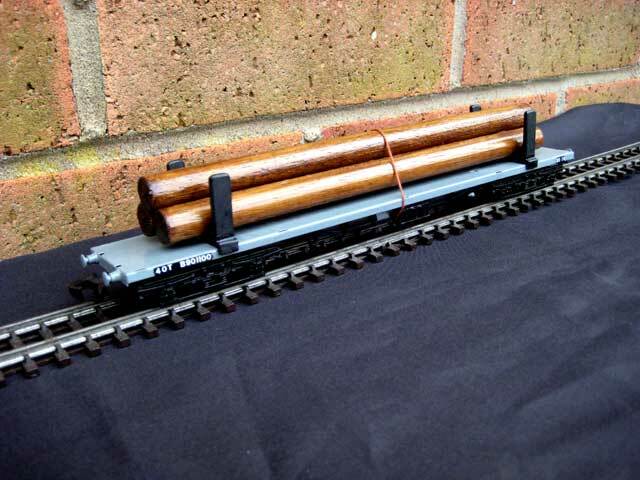 However it is not always viable to modify existing models therefore some types of carriages have to be built from kits. Using ready made bogies ensures running quality is equal to ready to run vehicles. NOTE. These models are not intended to be fine scale detailed replicas of their prototype but are designed to blend in with the standard proprietary production models of their era. The title of the presentation comes from the fact that all the components originated from their respective manufacturers (the genuine bit) but have been dismantled and rebuilt to produce models (the fake bit) that were either proposed or could have been made to compliment existing models. 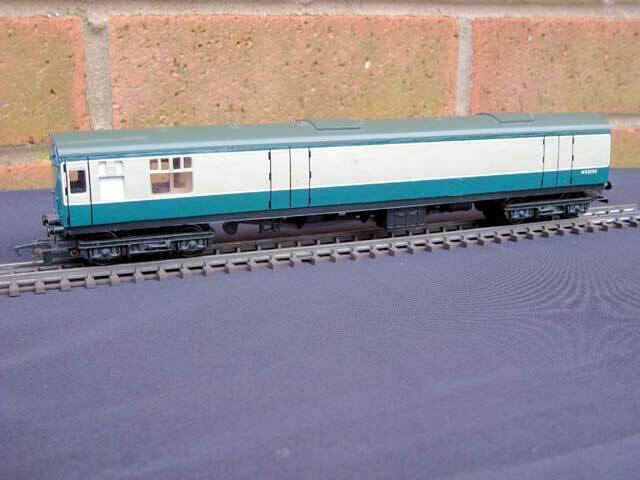 The complete Midland Region train with the appropriate vehicles as it could have appeared if issued during the Tri-ang Hornby era. See below for views of the Type 1 Motor Brake First and Types 4 and 5 Kitchen Parlour First vehicles that were not actually produced. The original Tri-ang Railways R555 and R556 Type 2 Blue Pullman power cars were issued as Motor Brake Seconds as used in the three, eight car trains that were operating on British Railways Western Region. 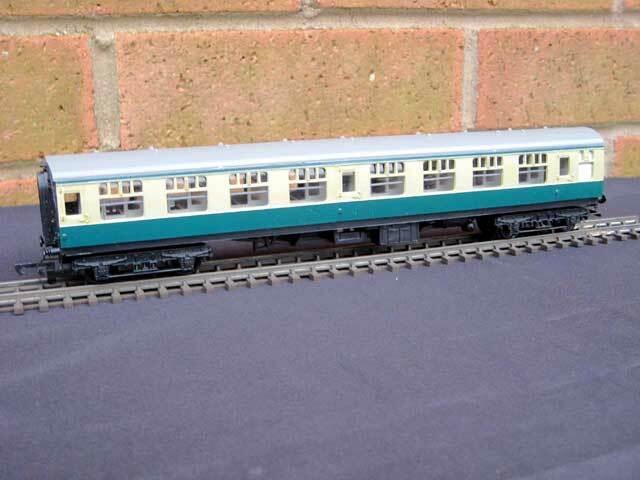 This model has been modified into a Type 1 Motor Brake First as used in the two, six car trains that were operating on the London Midland Region Midland Pullman. As supplied by Tri-ang Railways this vehicle would appear correct for a Western Region eight car train. Well, not quite. The passenger seating unit is arranged with the passageway on the left instead of the right viewed internally from the passenger doors. A simple reversal of the seating unit makes this correct. By removal of the window strip from an R426 Parlour First and replacing it with a seven window insert the Parlour Second is created. The Tri-ang seating units installed are from the seat units removed from the Motor Brake conversions from Western Seconds to Midland Firsts. 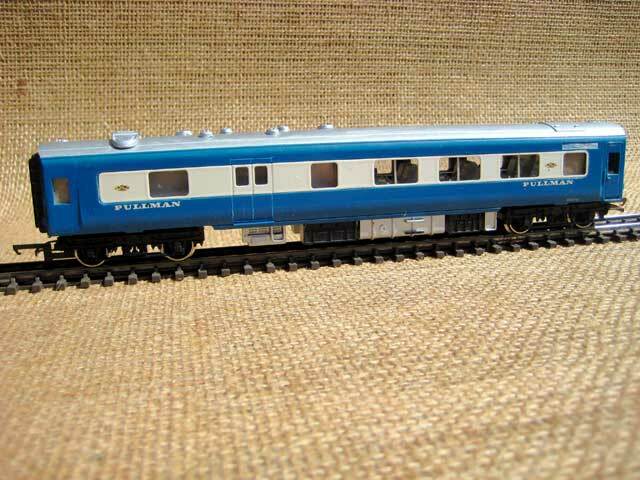 Tri-ang Railways only ever issued two out of the six types of cars used in the Blue Pullman trains. In this instance an R426 Type 6 Parlour First has been converted into a Type 4 Kitchen Parlour First. 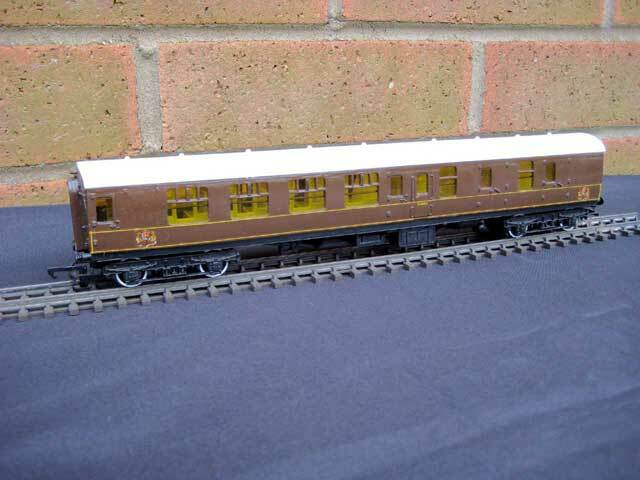 Along with two regular R426 Parlour Firsts, a correct representation of the Midland Pullman six car set may now be formed. At first the two types of Kitchen Parlour cars seem identical. There is a minor difference in the window arrangement in that the Western one has a full sized vestibule window opposite the toilet whereas the Midland car has a half sized window. This vehicle is also converted from an R426 Parlour First. 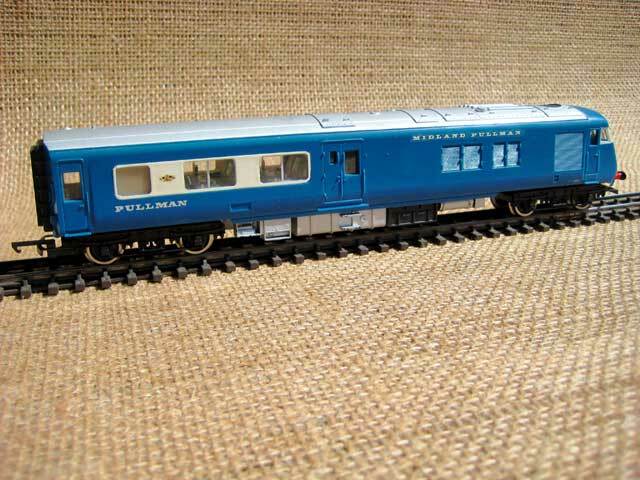 This is the only Blue Pullman vehicle that is common between the Midland and Western trains. It does not require any modification and is only shown to complete the family of Blue Pullman vehicles. 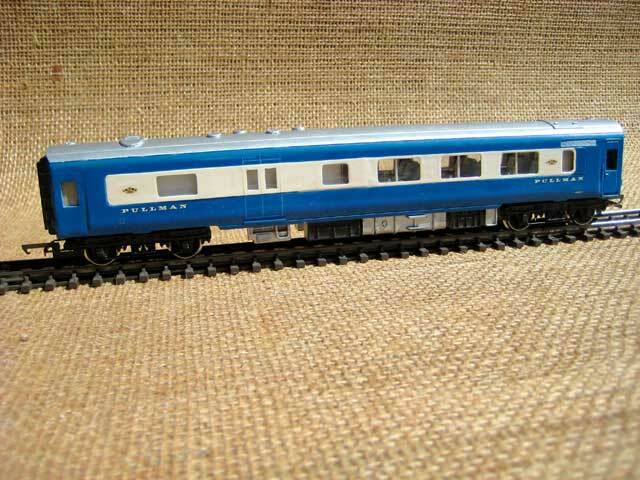 One of the more esoteric models produced by Tri-ang was the R625 Continental Sleeping Car. 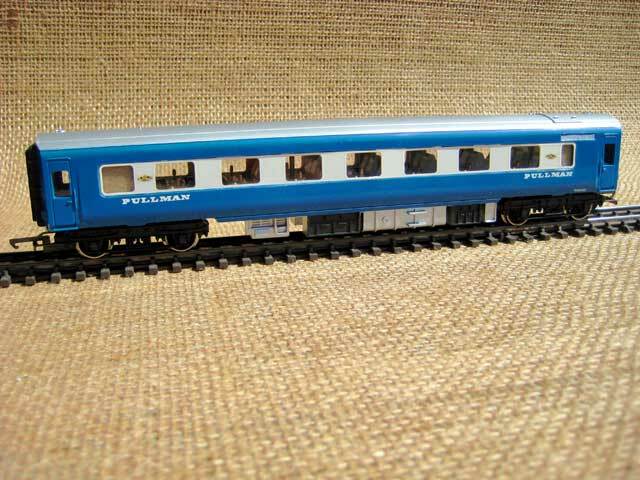 This was a standard Series 1 Pullman Car in CIWL blue with opaque windows on one side and the interior of a Series 1 Corridor Composite Car. It was suggested at the time of introduction that staying with the Pullman Car interior would have made a more appropriate CIWL Dining Car. This conversion is done by replacing the interior and removing the opaque windows. 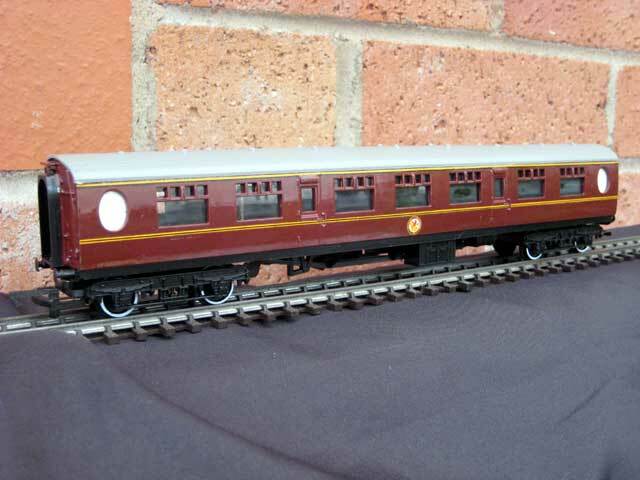 Hornby introduced a slightly modified R469 Pullman Parlour Car fitted with Gresley bogies in 1984. No brake or service vehicle was offered so this is coach is simply a repainted BSK representing the brake vehicle in use by VSOE at that time. Although similar in appearance to a Brake Second Corridor this Brake First Corridor has the larger compartments taken from a Composite Corridor coach. The arrangement of doors and windows in the brake section are also rearranged. 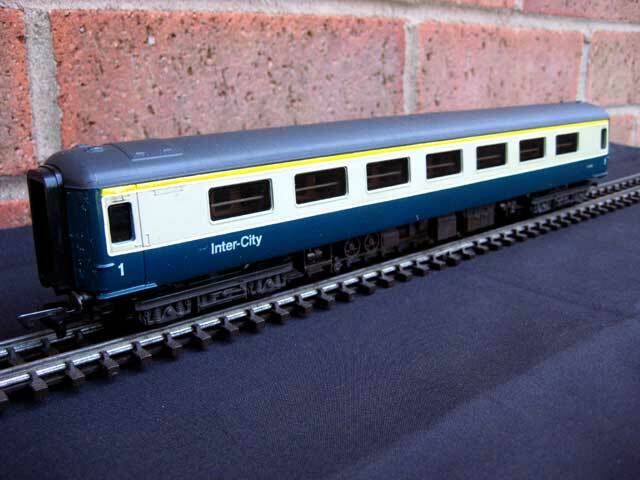 Although of similar appearance to other brake coaches, this conversion has irregularly spaced passenger windows and also the luxury of two toilet compartments. This is a modified Brake Second Corridor now with five passenger windows per side and a rearranged and smaller brake section. Note the additional window opposite the toilet, not present on a BSK. The easiest conversion to make is a Second Corridor coach. Sides from two Brake Second Corridor coaches are cut and joined to form the eight per side passenger windows. The original interiors are also cut and joined to form the interior compartments and toilets. Using the same exterior window arrangement as the SK, what was once one of the most common Mk.1 coaches on British Railways may be represented. In this case an open plan interior representing the 64 seats is made up from plastic card. 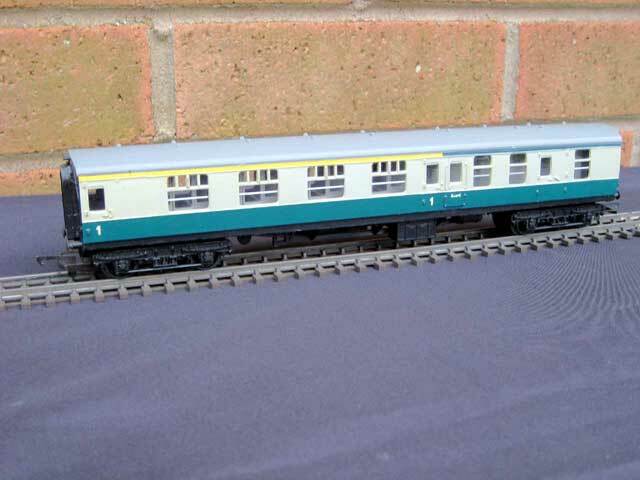 Again using the same exterior window arrangement as the SK, this model represents a fairly rare prototype coach that was found adjacent to Restaurant Kitchen cars to provide accommodation for dining passengers. A plastic interior is constructed representing the 2+1 across seating arrangement. The first twelve RMB cars built seated 48 and the remainder seated 44 because of the replacement of a seating bay with a storage cupboard. This model was converted to represent one of the original batch by the insertion of a window and seating bay to the left of the centre door. No ready to run models of this variation have been available. After cutting and reforming the original coach sides a surfeit of coach frames, bogies and roofs remain. By making new plastic sides this unusual vehicle may be made. No ready to run models of this type of vehicle have been available. This is probably the easiest conversion to make as it requires no modification to the exterior. It is made by replacing the original compartment interior with new open plan seating. Fortunately the real Mk.2 and Mk.2A BFK and BSO have identical window spacing. The original interior is retained for the FK conversion. This model requires two BFK coaches with the passenger windows from one substituting for the brake compartment in the other. 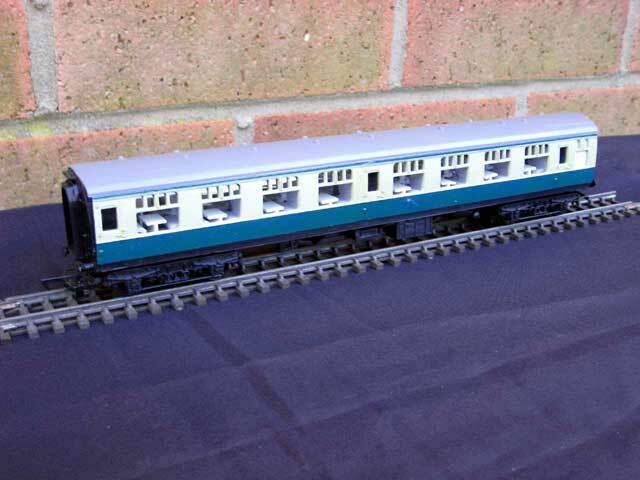 As the Mk.2 coaches are not modular, slightly more cutting and joining is required. The two seat units are joined to form the seven compartment interior. 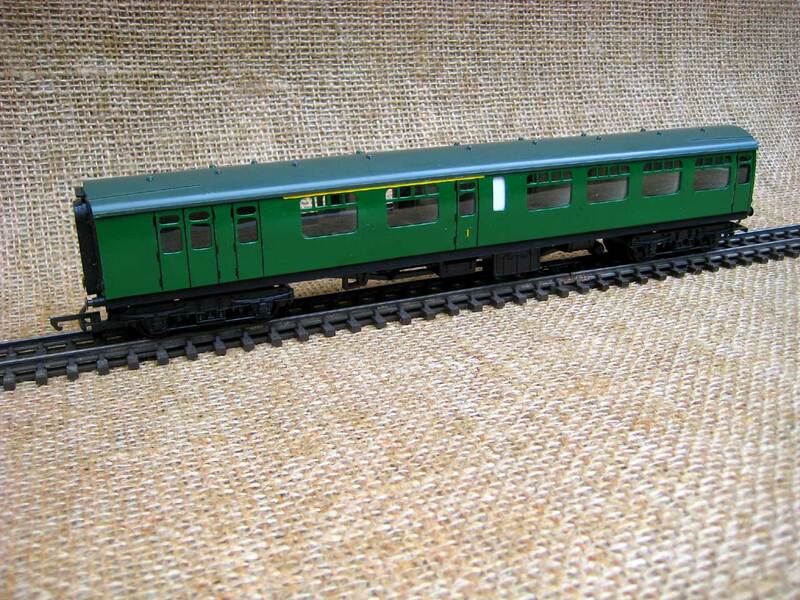 This carriage, utilising the Mk1 frame, roof and bogies was only ever issued in a teak finish and did not have an interior. 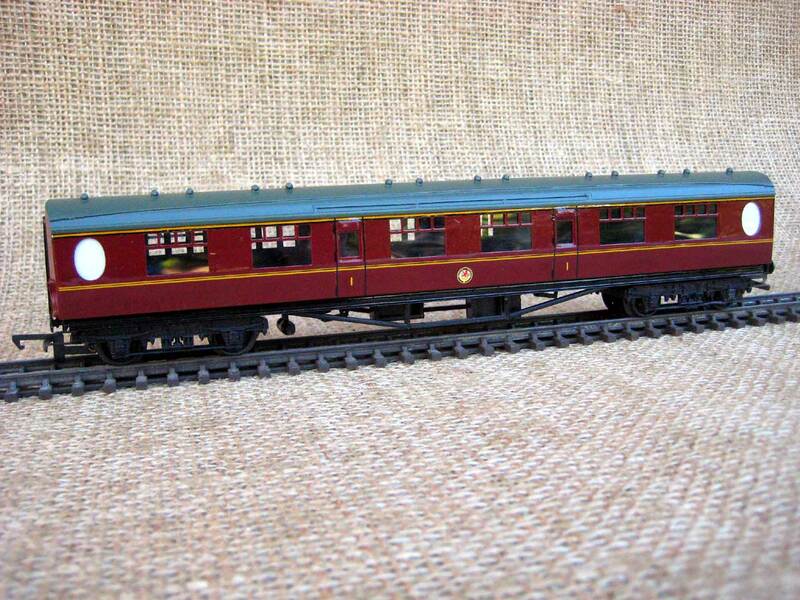 This version is in British Railways maroon and a compartment interior has been fabricated from plastic card. 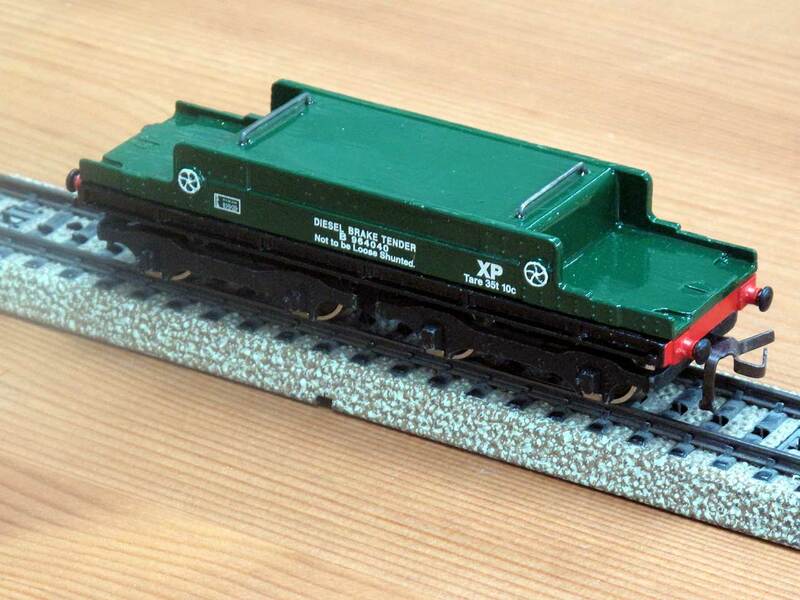 For once Hornby did not follow their usual practice and issue a Corridor Composite carriage. Probably because the real thing was a shorter than standard vehicle, they made a Corridor Second instead. 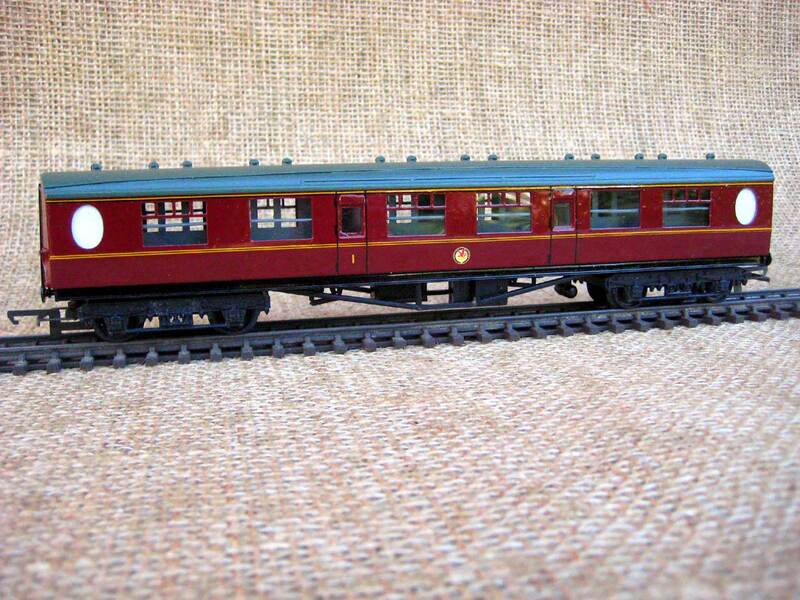 This version is in British Railways maroon and a compartment interior has been fabricated from plastic card. This vehicle was produced for inclusion in inexpensive starter train sets. It was only ever released in yellow. A green model was proposed but not issued. In 1963 Tri-ang introduced the R248, 2nd Series Transcontinental Baggage Car repainted as an Ambulance Car. No other models were produced in these colours to complement this vehicle. 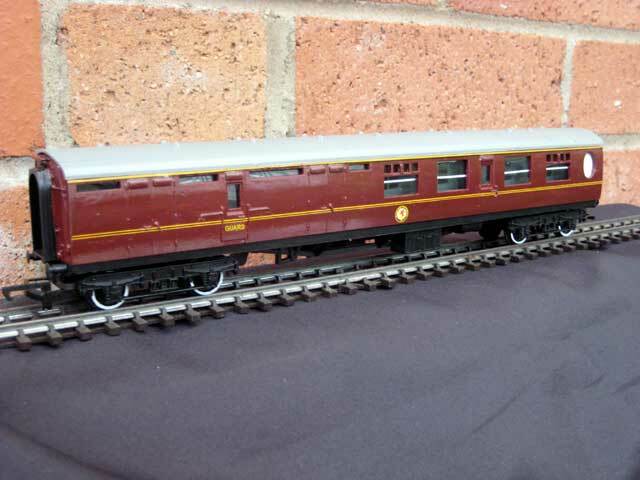 A simple solution to providing an additional different vehicle for an ambulance train could have been a 2nd Series Transcontinental Coach Car in matching colours. The Steeple Cab loco was produced in British Railways green and Transcontinental green both with operational pantograph and also in maroon with a fixed plastic non working pantograph (Primary Series). The black version shows another alternative livery that could have been. The Transcontinental Double Ended Electric Locomotive was produced originally in orange and green with Tri-ang Railways on the side. 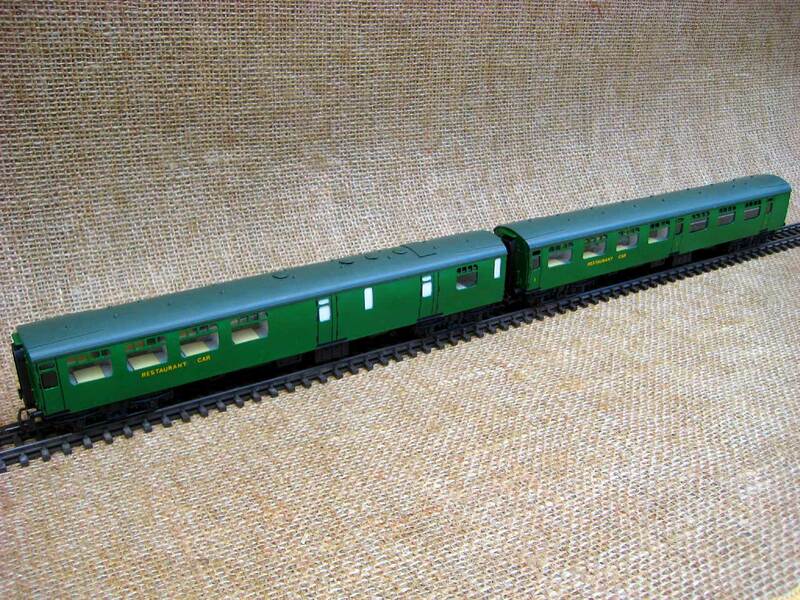 Later a pair of two tone green models were introduced, one with Tri-ang Railways and the other with the TR shield. Here is another possibility, orange and green with the TR shield instead of Tri-ang Railways. On the roof The R55 Transcontinental Diesel Locomotive there are four protrusions which are almost at the correct spacing to accept a pantograph. As was done with the R159 Double Ended Diesel Locomotive adapting it to the R257 electric locomotive, this could also have been done with the single ended unit too. There are also the four protrusions on the roof of the B unit locomotive and the adaptation to an electric locomotive booster unit is quite straightforward. The Class 23 Transcontinental Pacific loco was produced in large numbers and if a preserved example of the real thing was in service today a second water carrying tender may be required. 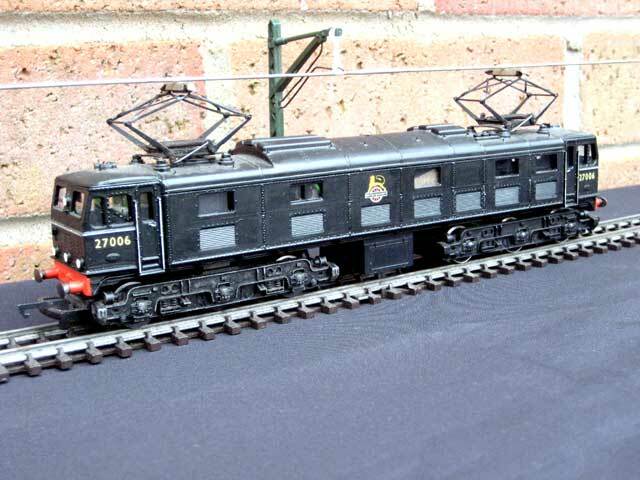 This is a fairly straightforward conversion of a standard tender but with the coal bunker removed and plated over. 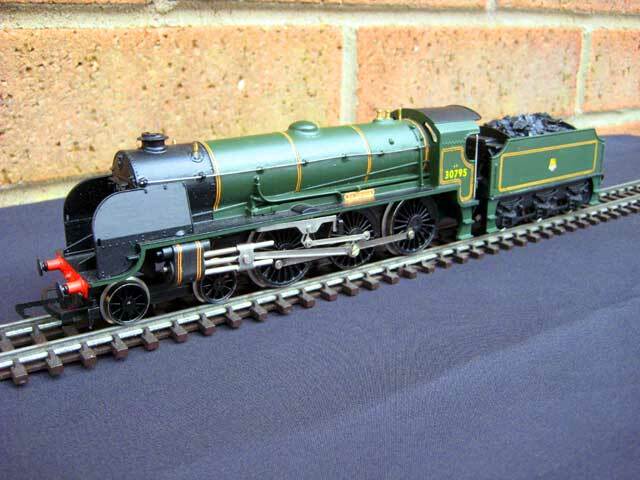 The "Sir Dinadan" was introduced 1976 in Southern Railways green at the height of Hornby's "Big Four" period when almost all steam locomotives that could be were issued only in the colours of the pre nationalised railway companies. 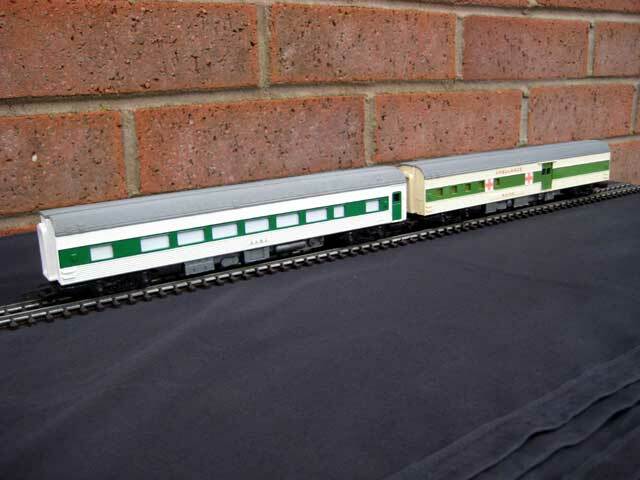 A British Railway green model was proposed but unfortunately did not reach production. An economic model, both for manufacturer and customer, would have been a "King Arthur" Class N15 issued in mixed traffic black. This would have made yet another attractive livery for this model, in this case representing the similar Class S15 locomotive. Nowadays however if this type of economic model was issued it would bring howls of virulent protest from the fine scale zealots. This variant was proposed but it also did not reach production. The Class J83 was also introduced in 1976, of course also in pre nationalised colours only. 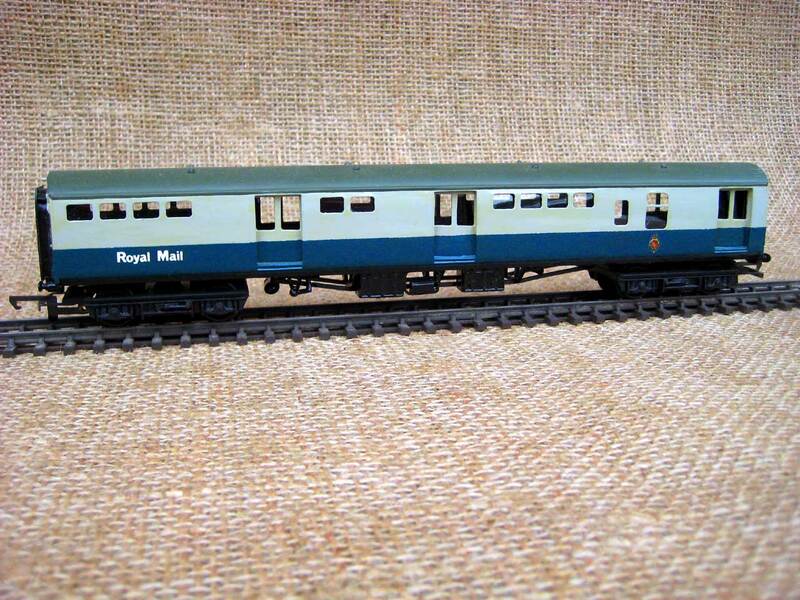 Eventually a British Railways variant was produced but this was also in green. Again, a black version was proposed but did not make it into production. The Class E2 was introduced in 1979 and was eventually produced in London Brighton & South Coast Railway Brown Umber, Southern Railway Olive Green and Southern Railway black liveries. An attractive fourth variant would have been in British Railways black. This locomotive was introduced in the 1973 catalogue. 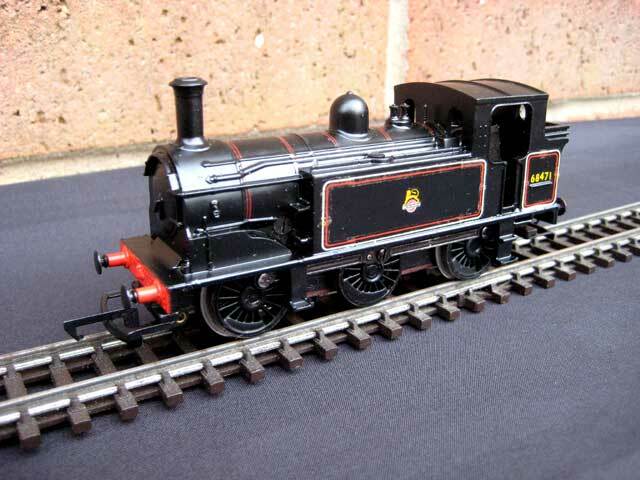 This is a classic example of an economic model produced from modifying the Southern Railway Class L1. 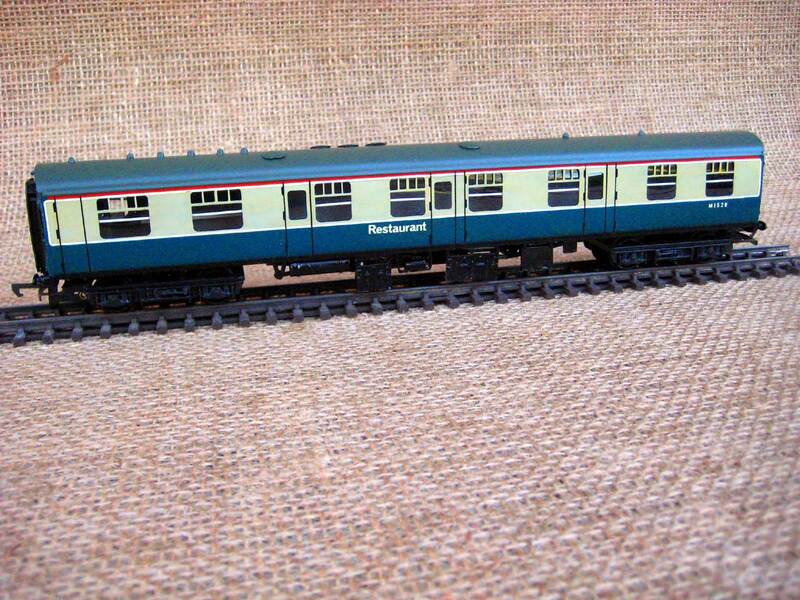 It was of course only issued in London Midland & Scottish Railway colours. A British Railways version would have offered the choice of another model. Once again the fine scale zealots decried this model but it did offer a new model of a locomotive that had not previously been produced. 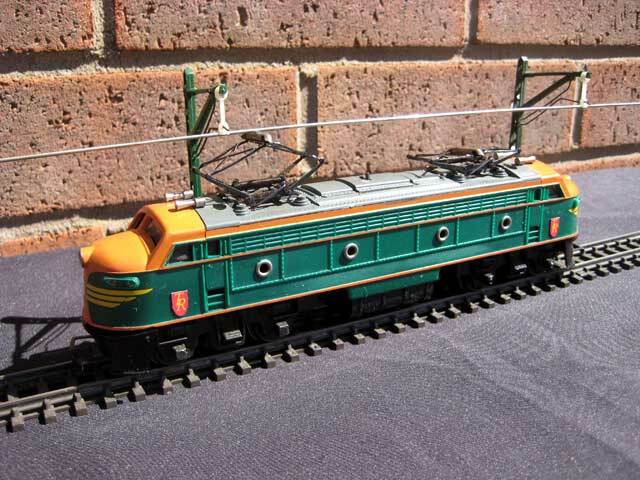 The EM2 model introduced into the Tri-ang Railways catalogue in 1960 was a lined green model, number 27000 and named Electra. When the prototype locomotives were introduced in 1954, they were in black as depicted here. This one would eventually be named "Pandora". 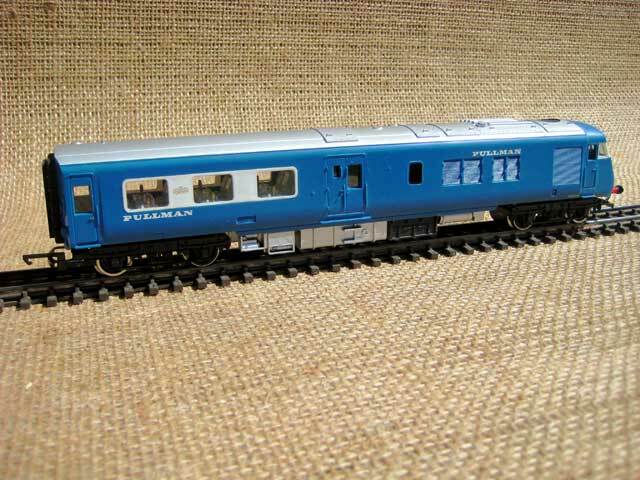 Tri-ang Railways and Tri-ang Hornby eventually made models in differing blue versions but not one in the original black. 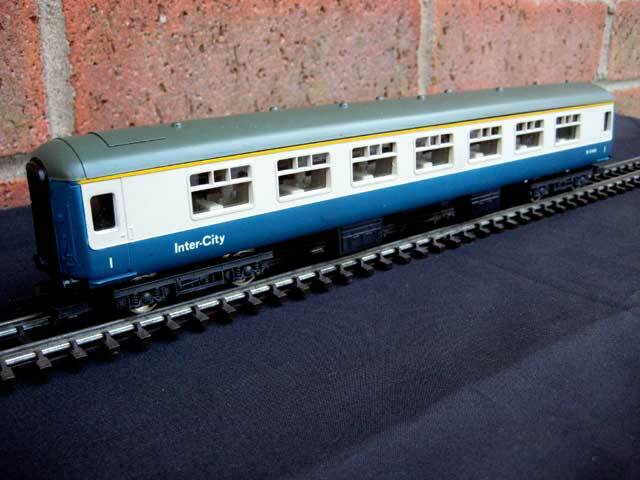 The Class 86 model was originally issued in British Rail blue and a succession of Inter City and other operator's colours but not in the original colour scheme of Electric Blue. The first prototype locomotive modified was E3173 with the addition of large external springs on the bogies thus earning the locomotive the unofficial nickname "Zebedee" after a character in the then current BBC TV program "Magic Roundabout". On the amalgamation (assimilation) of Hornby Dublo by Tri-ang Railways a special coupling converter wagon was produced with a Tri-ang Mk.3 tension lock coupling at one end and a Dublo (Peco) type coupling at the other. The wagon was illustrated in the 1965 Amalgamation Catalogue in green but when it appeared it was in black. The two versions are illustrated. 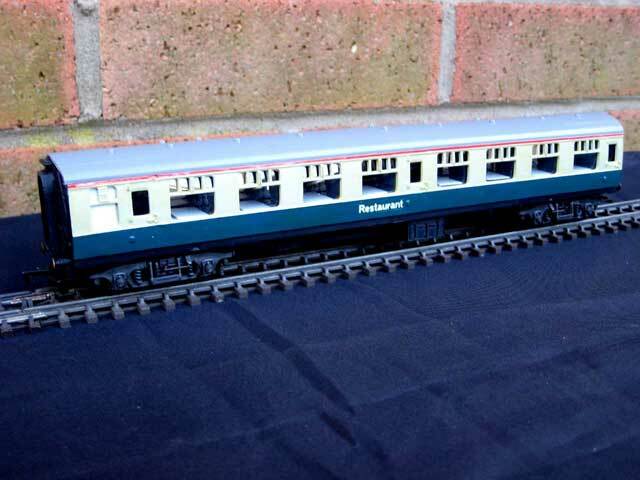 Models on sale in the UK were normally grey but this one in green utilises a flat car and bulkheads from a different model. Although the Flat Car was on sale in the UK it was not offered with a Logs Load. They were however offered for the Canadian market in grey or Canadian National black carrying a Logs Load. The flat car on sale in the UK was usually in grey. For the Canadian market a different model was offered lettered International Logging Company but usually with a Pulp Wood load. A black or grey log carrying flat car was offered for the Canadian market but this model is a hybrid of a Pulp Wood Car and a log carrying car. In the rush into service of the six Trailer Luggage Vans, one vehicle eluded the conversion into blue/grey colours and entered service in maroon and is represented by a standard BG but fitted with EPB (Electro Pneumatic Brake) equipment as used on Southern Region Electric Multiple Units. 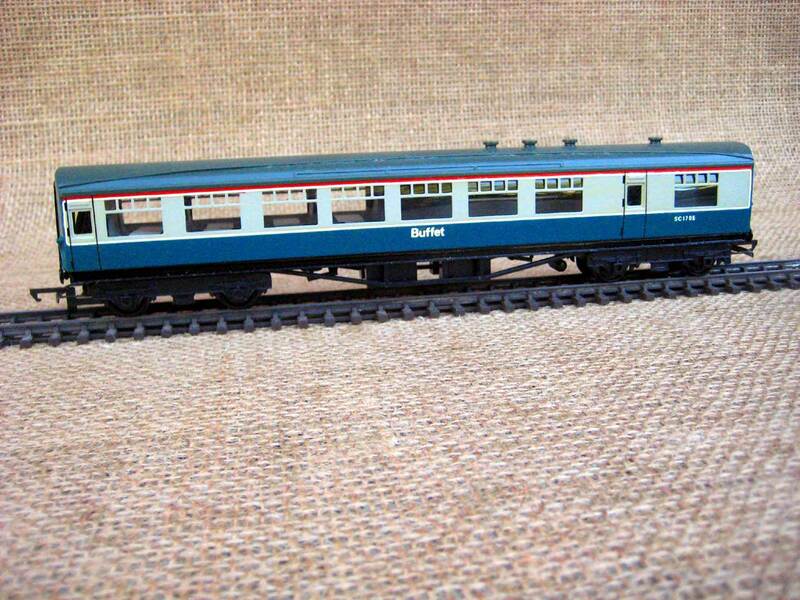 Hornby Dublo did not issue any coaches in the then new British Rail Blue/Grey colour scheme. This is a repainted Full Brake with the addition of EPB (Electro Pneumatic Brake) equipment as used on Southern Region Electric Multiple Units. Possible number of 4077? It is documented that Hornby Dublo intended to issue a Super Detail Restaurant Car in Southern Region green (4072). 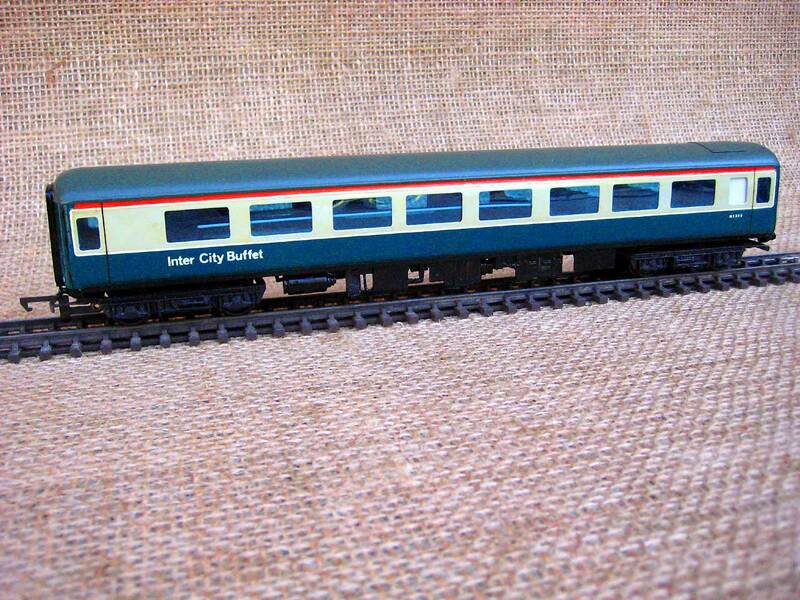 No doubt had Meccano remained in business longer, Super Detail coaches would have been issued in British Rail Blue/Grey. Possible number of 4073? 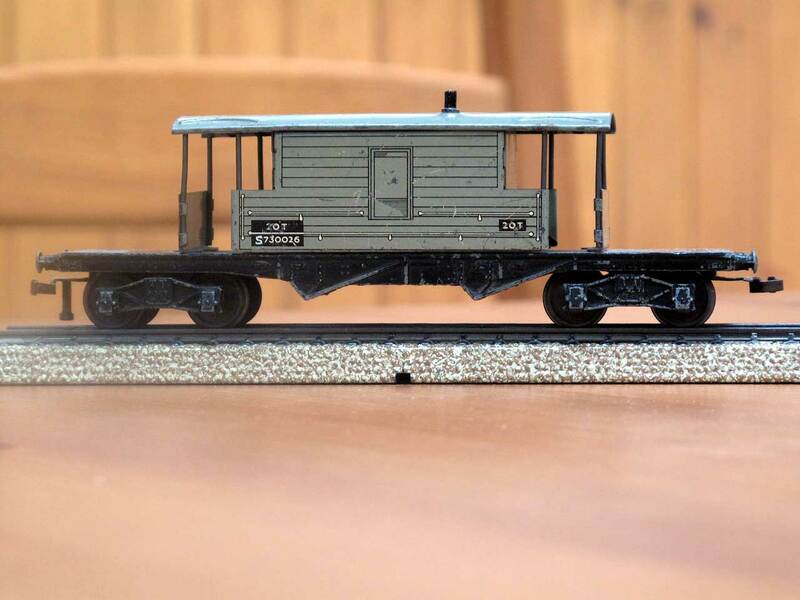 The Bogie Timber Wagon was to use a Super Detail coach underframe painted grey and use the transfers of the Bogie Well Wagon. In this case a coach underframe has been repainted and plastic restraints for the timber load have been fabricated. The number of this model was to be 4612. 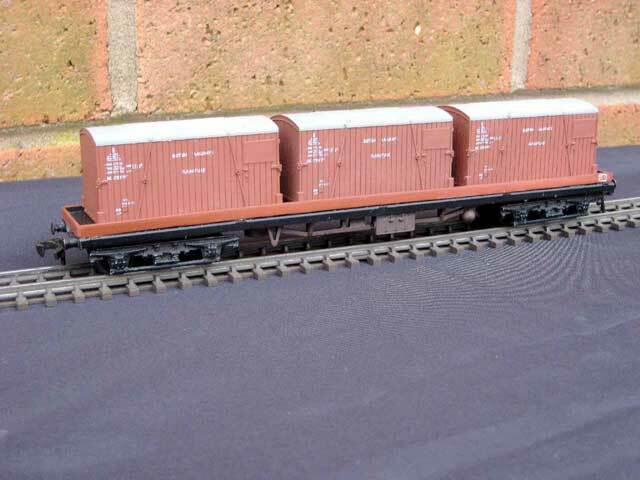 The Bogie Container Wagon also uses a Super Detail coach underframe and in this instance it is fitted with plastic planked decking and low retaining side walls. The containers are plastic, not original wooden ones, as this was the intention stated in the reference book. The number was to be 4638. 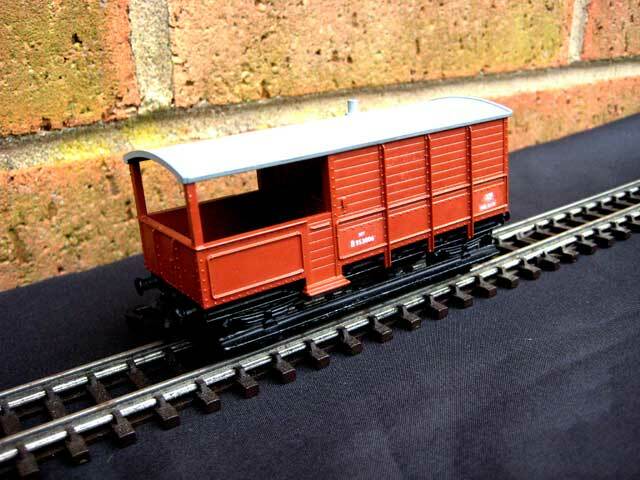 In the 1962, 1963 and 1964 Hornby Dublo catalogues, the Western Region brake van was illustrated in a bauxite colour but models in this livery did not seem to be produced. The bauxite coloured model illustrated is converted from the grey model. 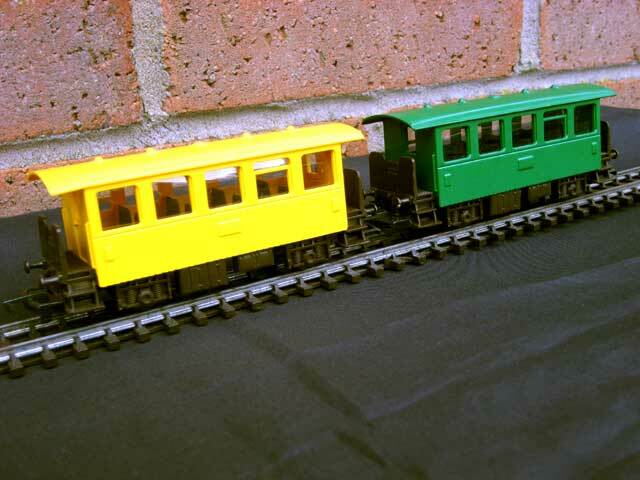 Although the LMR brake van was issued in both grey and bauxite colours, there was only one choice of livery for the WR and BR brake vans. The grey coloured model illustrated is converted from the bauxite model. This model is made entirely from Hornby Dublo components apart from the aluminium block in the centre, underneath the upturned well-wagon body. Model made and photo supplied by Brian Malaws. 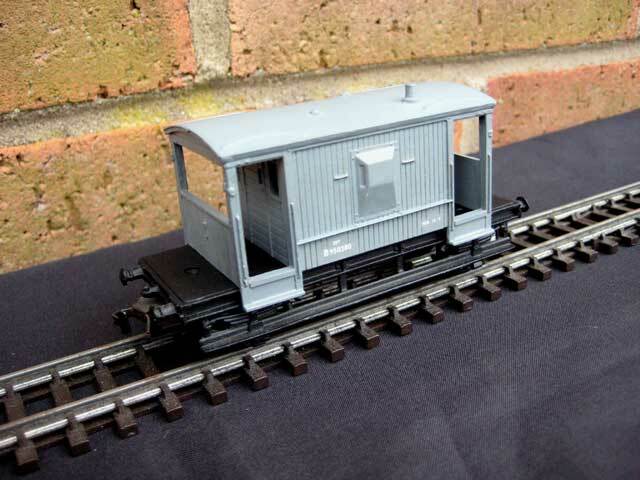 The Southern 'Queen Mary' bogie brake van, made with Hornby Dublo components. 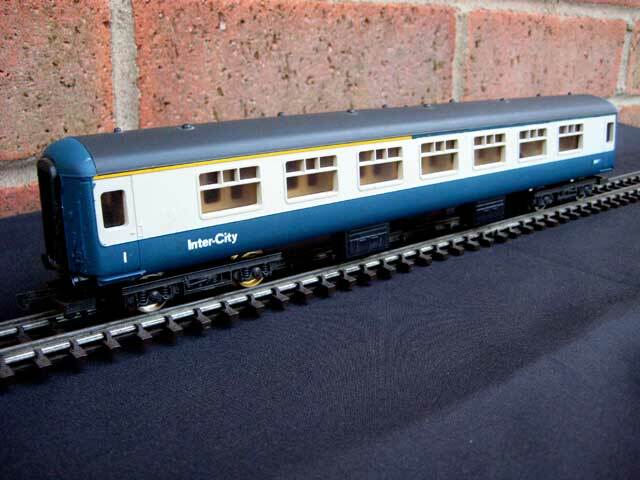 No Composite Corridor carriages in the Mk2 series were built from new for British Rail but this model represents one of five Corridor Firsts that ScotRail converted to Corridor Composites in the 1980's by downgrading four of the first class compartments to standard class. The original carriage as supplied is configured as a Corridor First. 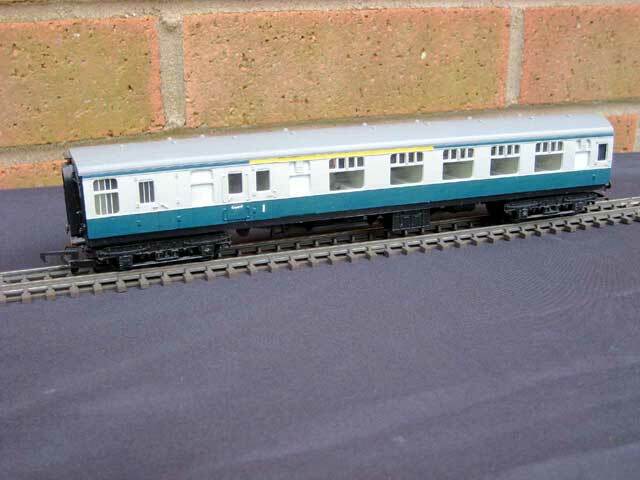 This simple conversion uses the interior from the Airfix Mk2d Open First. 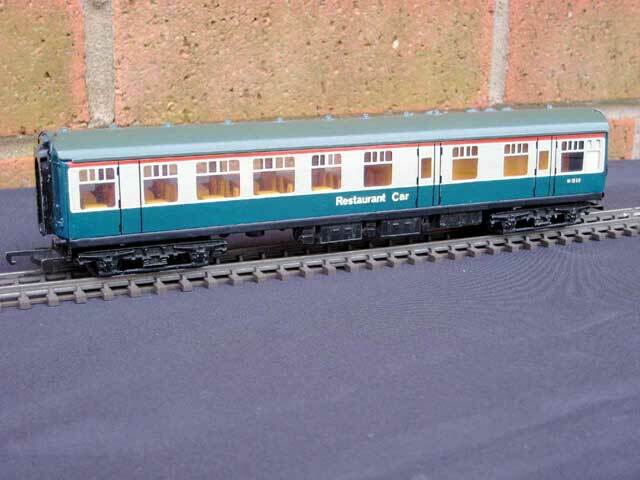 No catering cars were built from new in the Mk2 series and this model represents one of the Open Firsts that were converted for use in Cross Country sets. This model was made by filling in the toilet window and the two adjacent seating bay windows. 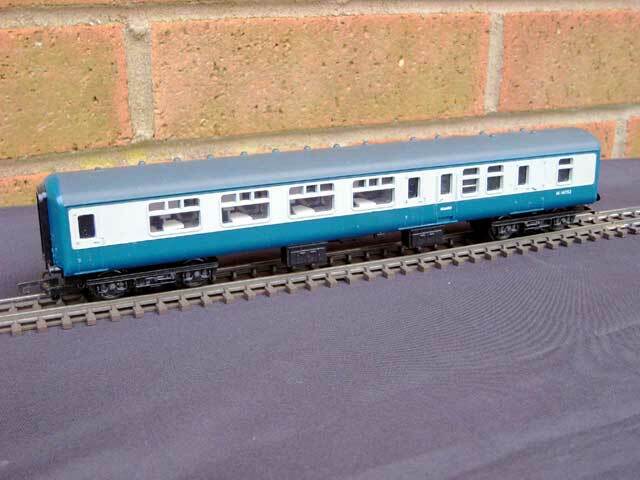 The model can also represent the externally similar Restaurant Lounge Open (RLO) as used in sleeper trains. Lima were well known for producing as many colour variations as possible from their models. 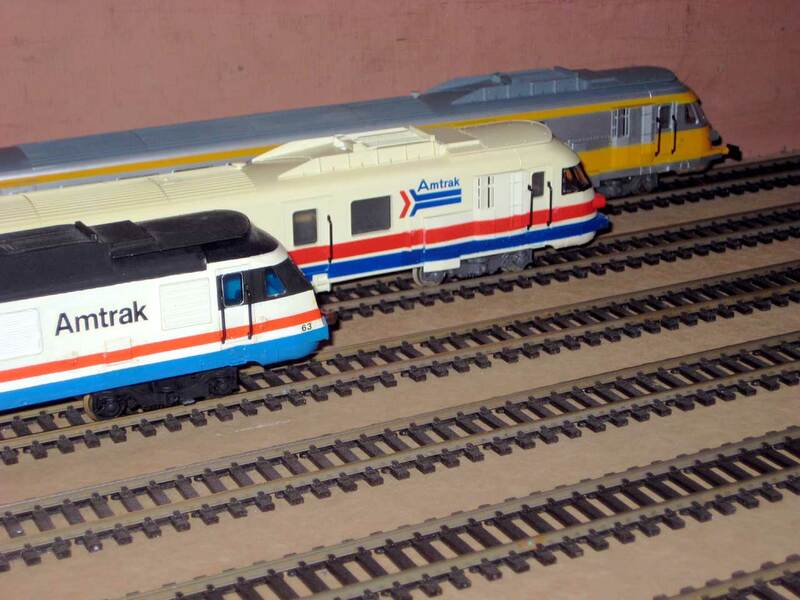 Although the Rc4 was produced in both Swedish and Austrian colours they missed out on this single example that operated for Amtrak as a demonstrator. The demonstration was successful resulting in an order for a fleet of AEM7 locomotives built under licence by EMD. 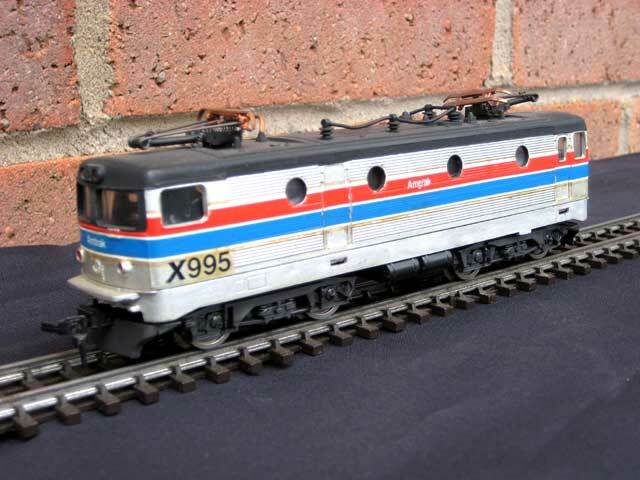 This model is a standard Lima Austrian model repainted and fitted with American couplers. The original carriage as supplied is configured as an Open First. 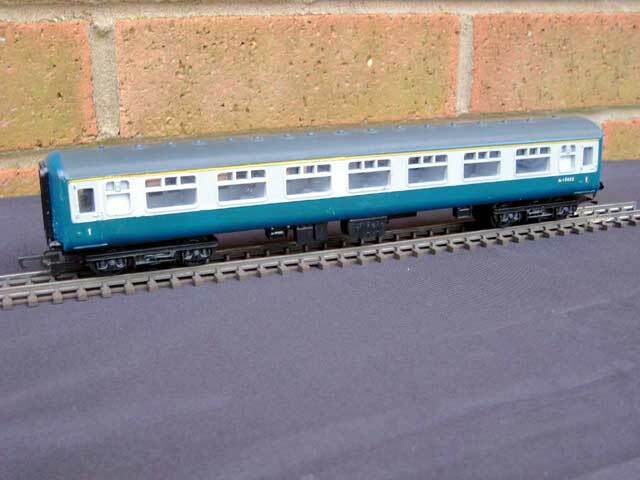 This simple conversion uses the interior from the Lima Mk2b Corridor first. Whilst the ASEA Rc4 locomotive was on demonstration in the USA, a French locomotive was also demonstrated. This did not result in any sales. 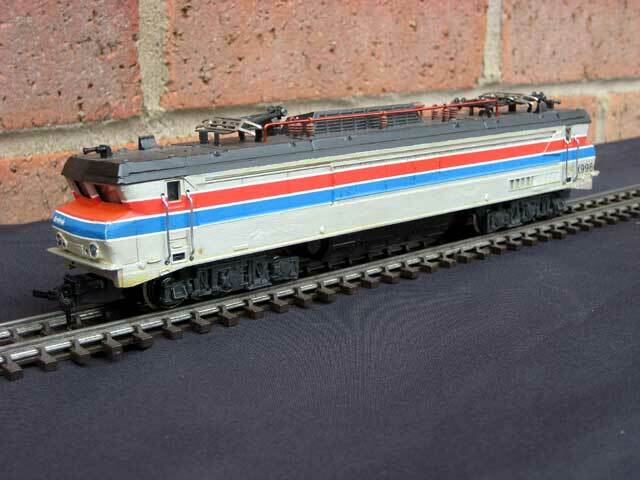 This model is a standard Jouef SNCF model repainted and fitted with American couplers. Jouef produced a five car RTG train in SNCF colours consisting of two power cars, a food service car, a composite car and a standard class car. 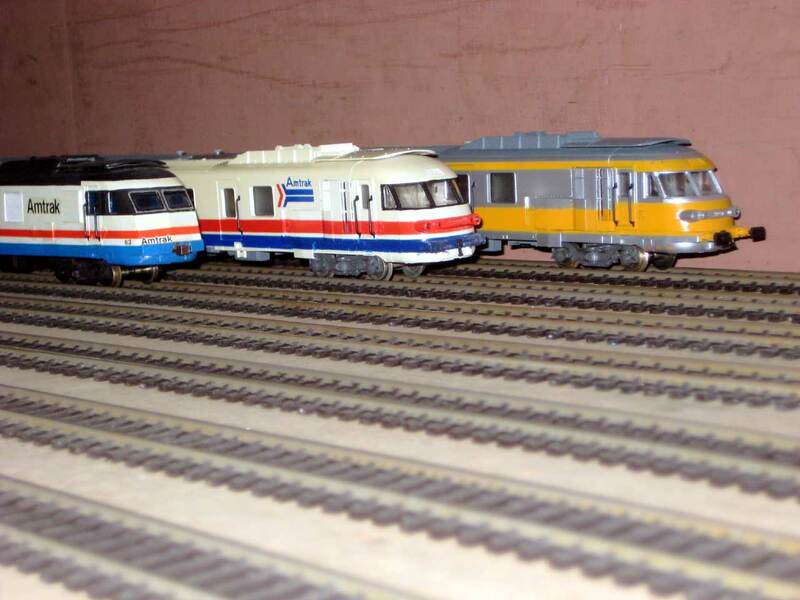 When Amtrak purchased some of these trains in the mid 1970's, Jouef produced models in Amtrak colours. The most obvious discrepancy between the two models was the European style buffers on the outer ends of the power cars. They have been removed from the model. After acquiring the French trains, Amtrak purchased more Turboliners but these were built in America to a more streamlined design. The rebuilt model shown here is a Jouef model modified with new end cabs, new windows and other alterations to represent the rebuilt French trains. 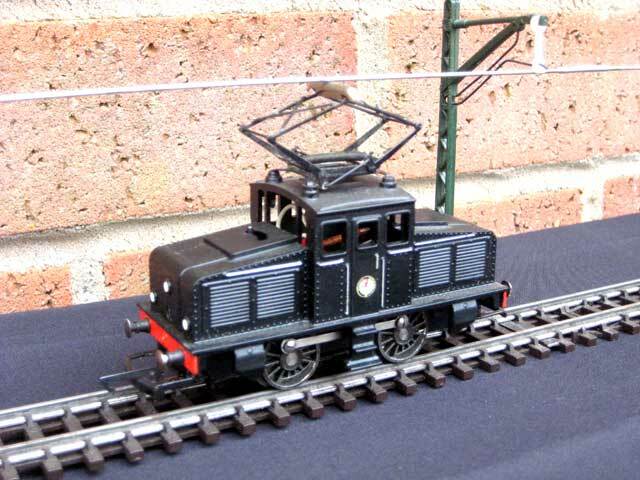 After making the Tri-ang Hornby conversions you are left with a surfeit of frames and roofs. A most economical use for these surplus parts was to fit new sides as made by LAM models of Plumstead, London. At the time these were listed at £0.86 for two coach sides. Interiors were made from surplus Tri-ang corridor interiors. Some ex Southern Railway vehicles received paint jobs other than green. 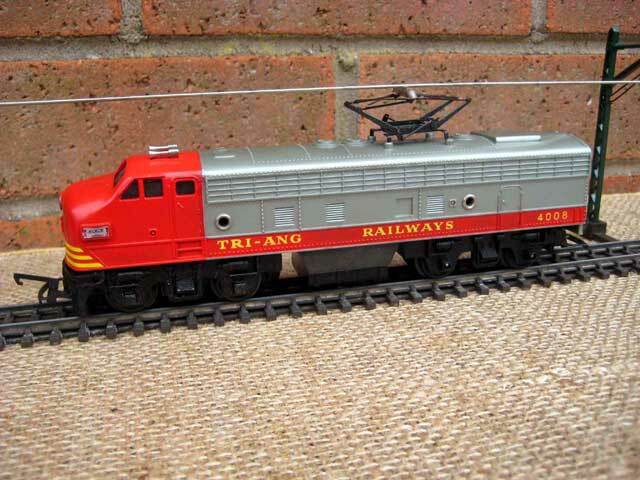 This is again a Tri-ang LAM hybrid model. 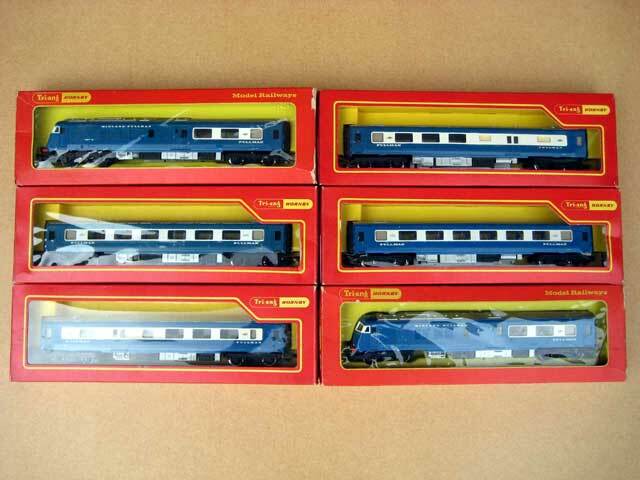 LAM models produced a good range of flat pre punched plastic card Bulleid coach sides. Once rolled to give tumblehome they were a direct replacement for the original Tri-ang sides. 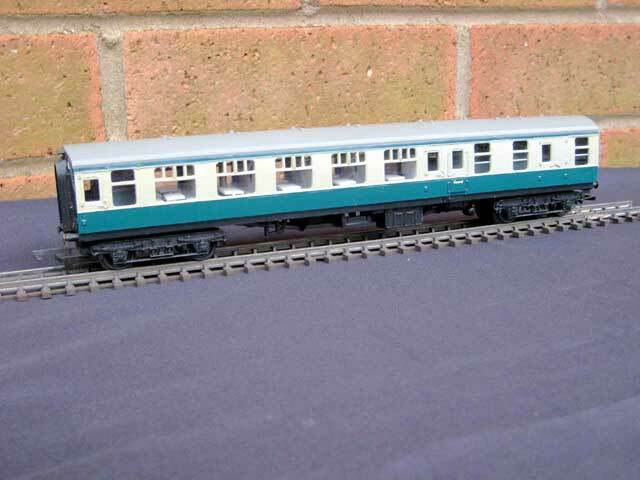 LAM models even made pre punched sides with sides extended covering the solebar as existed on the Bournemouth six car coach sets. The illustration is of the two centre vehicles containing the catering facilities. 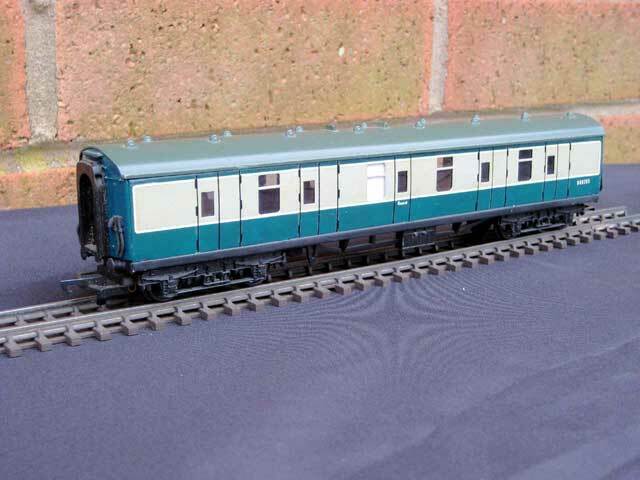 Extending the range to compliment the Tri-ang Hornby Thompson coaches is a Corridor First, a kit by BSL. Looking similar to the Corridor Second, this vehicle has six and not seven compartments. 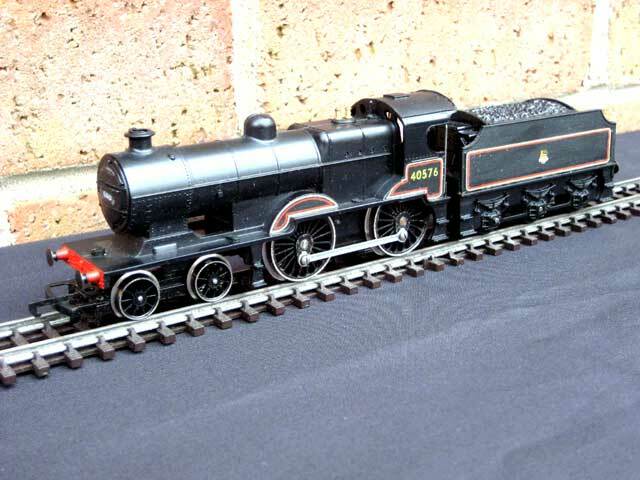 Yes, the bogies are incorrect but so are the ones on the Tri-ang Hornby models. The composite car also has six compartments but this time the vehicle is shorter because of the three second class compartments. Again a BSL kit. 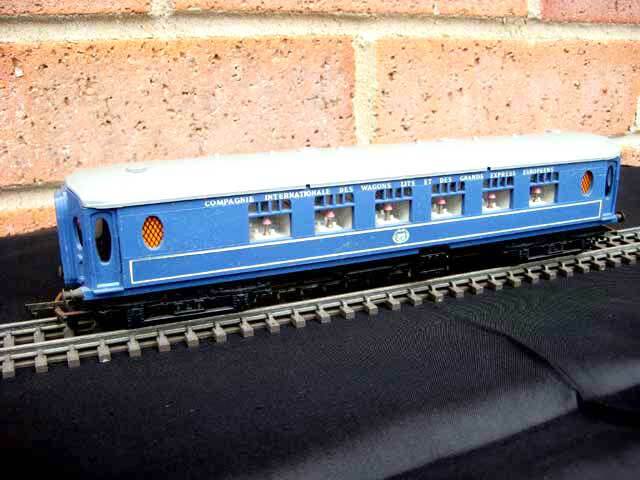 Bogies are once again Tri-ang Hornby matching the ones on their Thompson coaches. 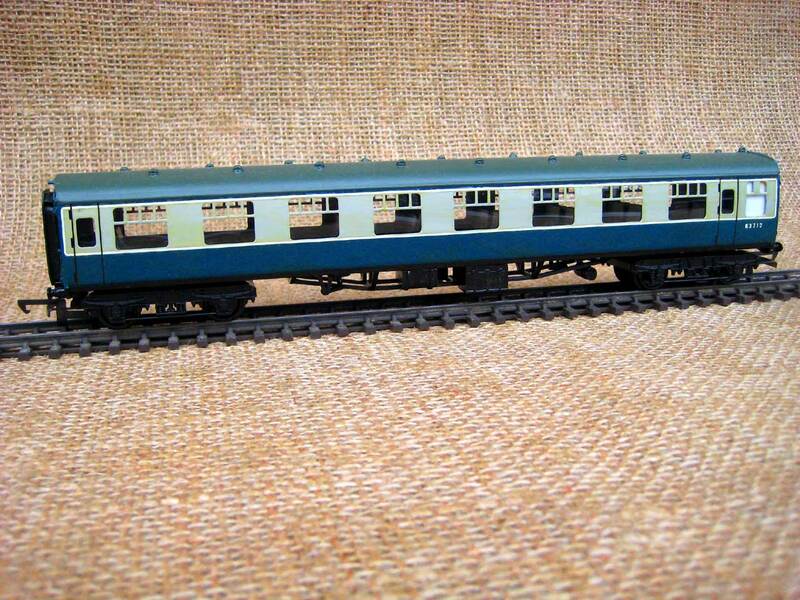 Tri-ang Hornby only produced two Thompson passenger cars, a BSK and a SK but did not offer any catering cars. This model is built from a BSL kit. 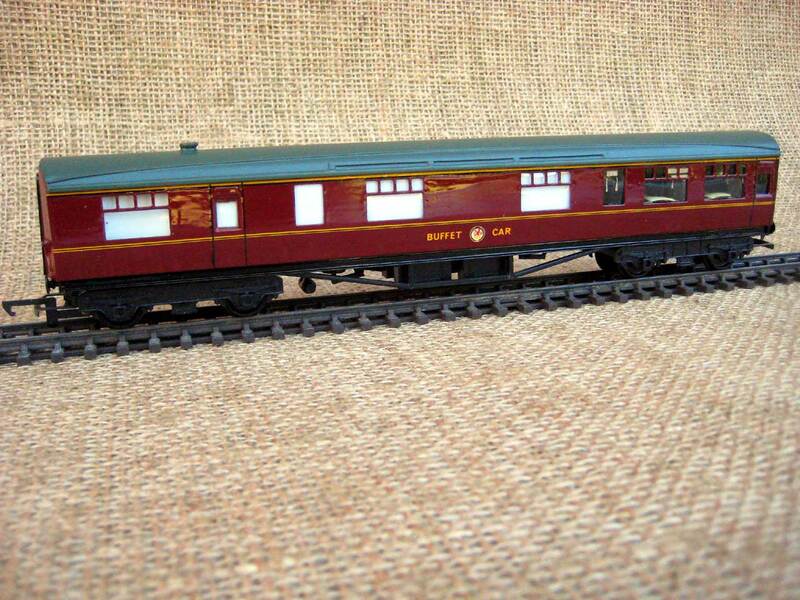 Tri-ang Hornby only produced two Thompson passenger cars, a BSK and a SK but did not offer any catering cars. 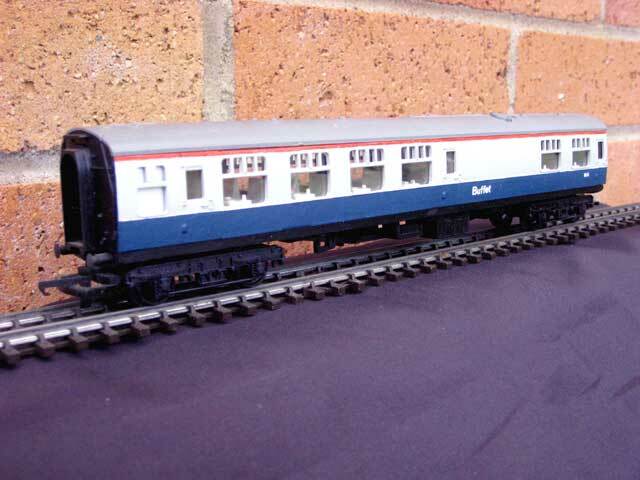 This model is a BSL kit suitably modified with filled in windows. 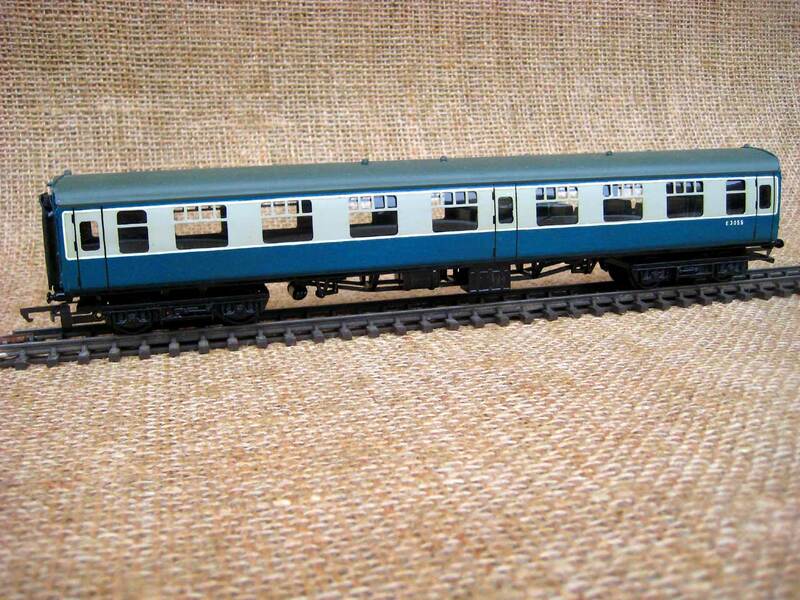 The real carriage was rebuilt by BR and lasted in service long enough to receive Blue/Grey colours. 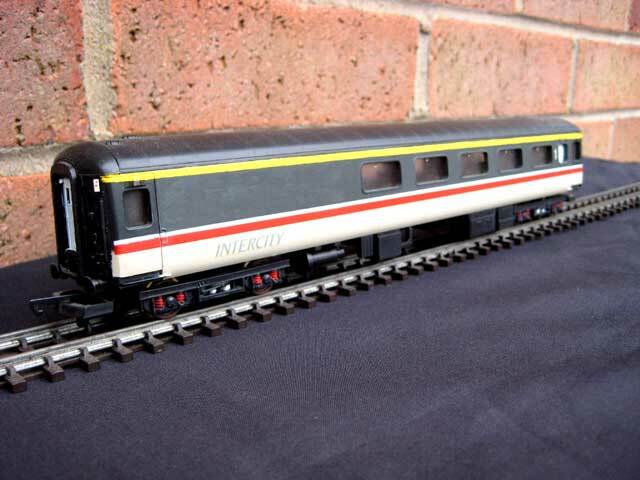 The real vehicle was converted from a regular corridor first coach and following this initiative the model was created by modifying the kit for a corridor first coach. 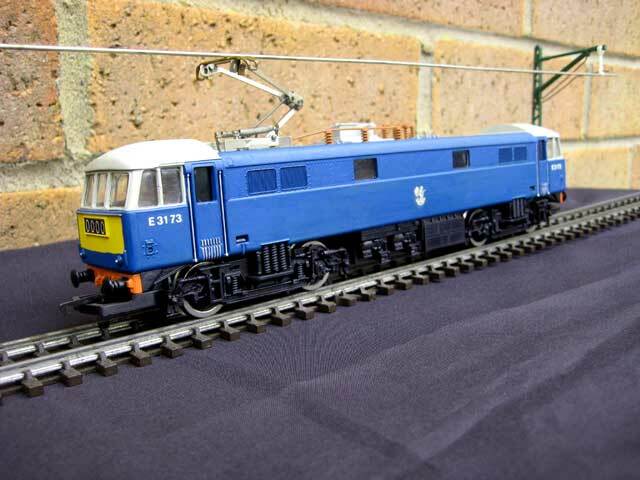 The original kit was by MTK (Modern Traction Kits) who produced a vast range of kits. 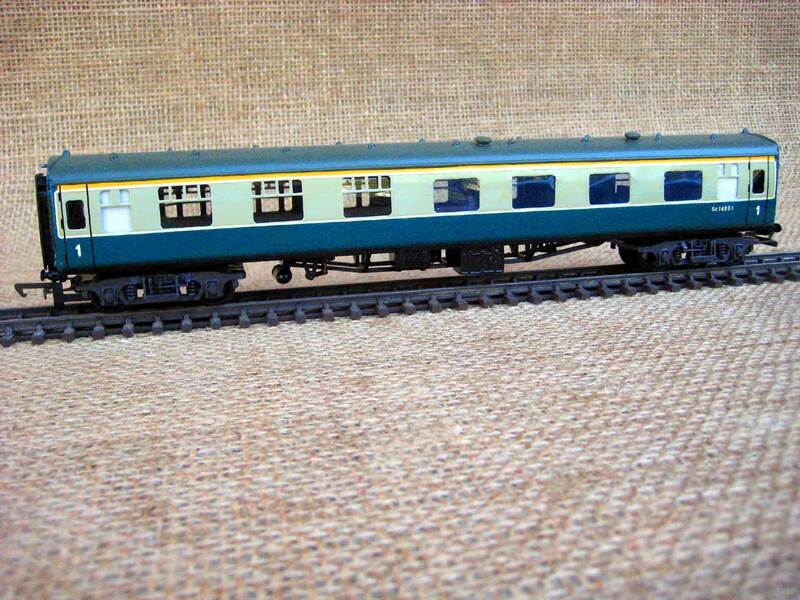 This model is running on Trix Liliput commonwealth bogies to ensure good running. The bogie kits supplied were less than ideal. Kitchen cars have never been popular models by the manufacturers so if you want to provide your model passengers with full dining facilities, this is the type of car required along with a Restaurant Open car. 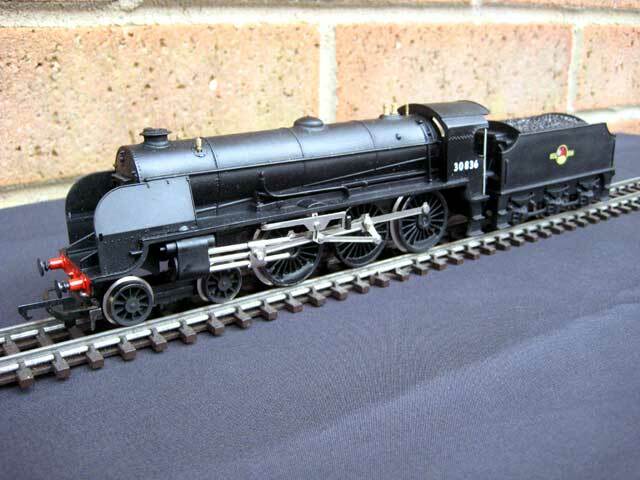 This is also an MTK item and is running on Tri-ang Hornby B4 bogies, (similar to the correct B5 bogies) for the same reliability reasons. Originally an open first, this MTK model represents one of the vehicles that were reclassified as seconds. Once again running quality is assured as it sits on Tri-ang Hornby B4 bogies. Early built TSO's were fitted with only four doors allowing extra space for the eight seating bays. Subsequent delays in loading and unloading resulted in the vast majority of subsequent builds having central doors and a central vestibule. 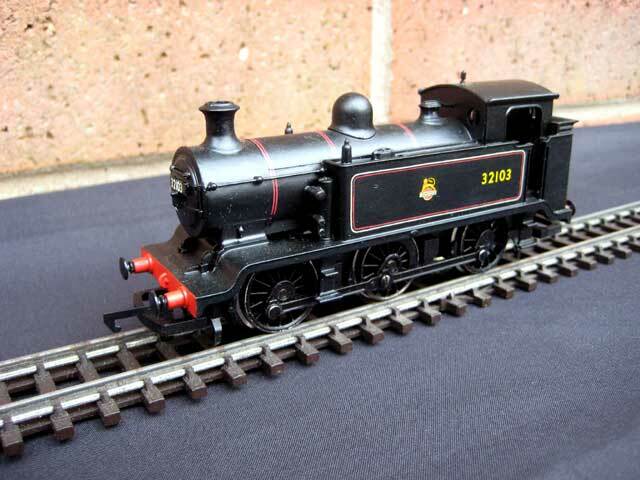 Again an MTK item running on Tri-ang Hornby B1 bogies. 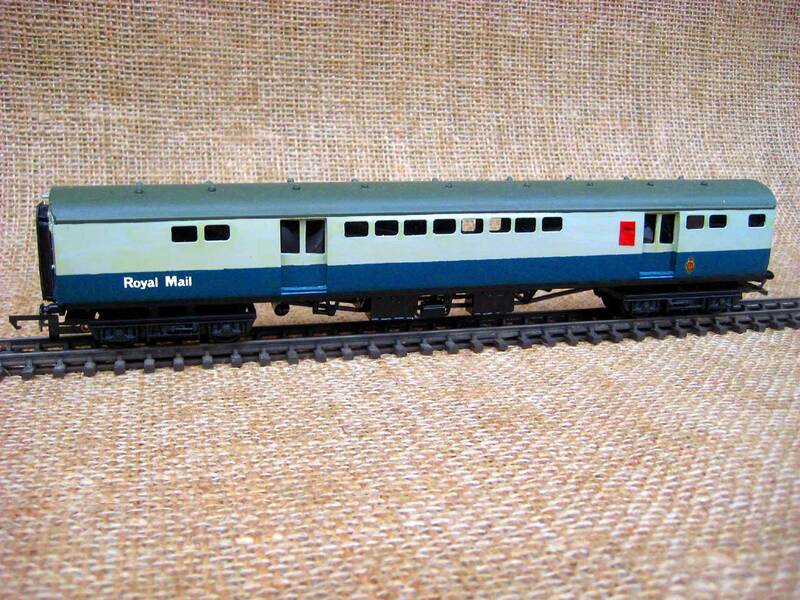 This is an MTK item representing a mail sorting van and is running on Tri-ang Hornby B4 bogies. This vehicle is again a modified MTK item, this time converted from a Mk.2d kit. The left hand toilet window was filled in and a new window inserted on the opposite side. The 24 table seats and self service interior was constructed from plastic card. 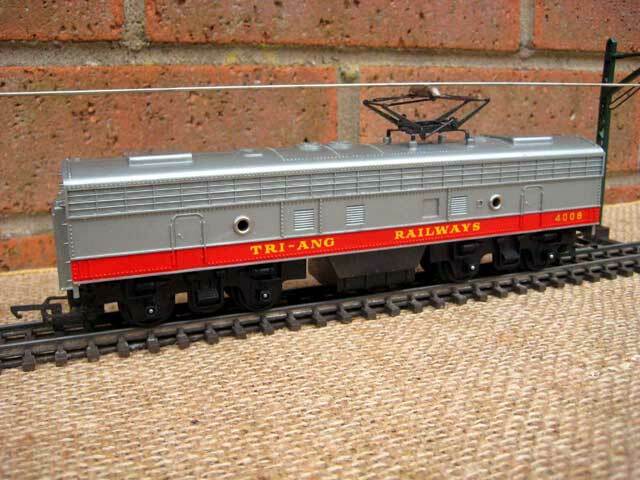 Again Tri-ang Hornby B4 bogies have been used. For more on the background of the Tri-ang coaches follow the Coaches link. 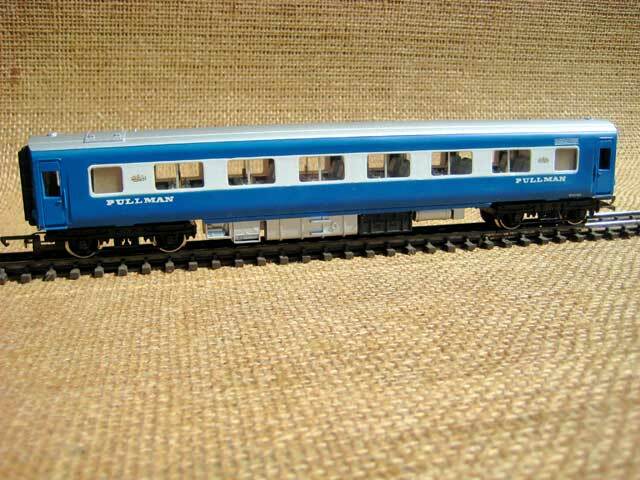 For more on the adaptation of the Tri-ang Blue Pullman follow the Blue Pullman link. For more on some of the less common real coaches follow the BR Coaches link.